Physicists are a silly lot, especially when it comes to naming things. 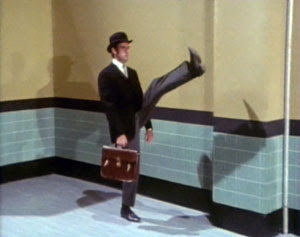 Given some of the humdingers that they have come up with, you might think that they might have their very own Ministry of Silly Names (MoSN), something like the Ministry of Silly Walks, featured in a 1970 sketch from the "Monty Python's Flying Circus" television show. Take, for example, the names given to the various types of quarks, those reclusive, fractionally-charged, point-like particles that are the building blocks of protons and neutrons. First, it would have to be conceded that the name quark, itself, is pretty silly - not surprising, given that it was selected because it sounds like the call of a duck. This silliness is only compounded when one notes that quarks don't come in types, they come in flavors - as though specifying a fundamental characteristic of some of the tiniest bits of matter was akin to ordering an ice cream cone at the neighborhood Baskin Robbins. A little dignity is restored by the fact that the two "original" quark flavors have the unremarkable names up and down. 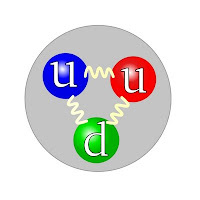 To a good approximation, protons are constructed from 2 up quarks, designated, conventionally, by the letter 'u', and one down quark, designated by 'd'; neutrons, likewise, from 2 down quarks and one up quark. The second generation of quarks flavors - more massive than up and down, so it took collisions created by high-energy particle accelerators to produce them in abundance - were given the apparently silly names, strange ('s') and charm ('c'). Strange, it turned out, was not all that silly a choice. When particles called K-mesons, or kaons, were first created, they were observed to decay into a triplet of garden-variety pions, but they took their good time doing so. 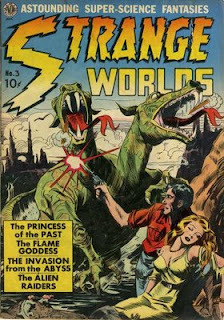 Something "strange" was keeping them from decaying as quickly as had been expected. A special property was proposed, strangeness, to account for the kaon's longevity. Such a property, called a conserved quantity, is difficult, if not impossible, to shed - sort of like a bad cosmological penny. Thus, the kaon is stymied in its routine attempts to self-destruct, and must resort to slow-as-molasses assistance from the feeble weak interaction to get the job done. You see, the weak interaction doesn't hold strangeness in any special regard and would just as soon eradicate it as keep it around, of course taking in its own sweet time. I wish I could say that there was a similarly dignified story to account for the origin of the designation charm as a quark flavor, but, to be frank, once strange found its way into the particle physics lexicon, a kind of silliness mania took hold. Indeed, the flavors of the third generation of quarks, then yet to be discovered, were christened beauty and truth by some silly researchers. There were fears - smirking hopes in some quarters, actually - that it would just be a matter of time before newspaper headlines would appear proclaiming such things as: "Beauty Revealed by Fermilab Scientists" or "Particle Physicists Seek Truth with New Accelerator". Something had to be done. As a result, the Ministry of Silly Names put its foot down and a silly-name reformation was launched. 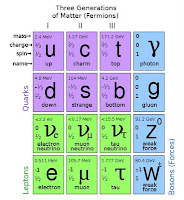 When the quark dust settled, charm, old enough to sound quaint, was, graciously, grandfathered in, but beauty and truth were sent packing, replaced with the names bottom ('b')and top ('t'). How the silly how fallen! Not going down without a fight, the forces of silliness mounted a rear guard action, so to speak. When the b quark was first created in particle collisions, it was always produced in conjunction with its antimatter counterpart, the b antiquark. So, given the way matter and antimatter cancel each other out, the particle that they formed possessed no net "bottomness". This was just the kind of opening that the silliness resistance needed. The search was on for creating a so-called B meson, a particle containing a single, unbalanced b antiquark, one that would brazenly show its "bare bottom". It was a last hurrah for quark name silliness. Well, silly or not, the sextet of quarks - up, down, strange, charm, bottom, and top - have now all been detected, advancing the cause of the Standard Model of elementary particles, if not the cause of respectable physics names, considerably. This is as close as physicists have come so far to a long-sought theory of everything (ToE), and by that I mean a comprehensive theory of matter and energy and (most of) the forces of nature that has undergone rigorous experimental tests. There is, though, one important piece still missing from from the Standard Model puzzle and it is called the Higgs particle, an eponym, named for the theoretician Peter Higgs, so hardly a silly name. 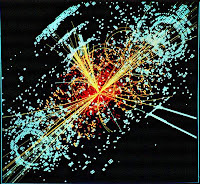 Unfortunately, because of the pivotal role the Higgs plays in bestowing mass on other particles in the Standard Model, Leon Lederman, who, it turns out, was a co-discoverer of the b quark, nick-named it the God Particle. No doubt this nickname will be the inspiration for silly headlines when the Higgs is detected, as is likely to be the case, in the next couple of years. There's not much that can be done to avoid this embarrassment. Particle nicknames - much like Bush-era financial markets - are pretty much unregulated. To put things in perspective, and to give the silly physicists their due, let's turn to the book of Genesis for some guidance about the challenge posed by naming things. the Lord God formed every beast of the field, and every fowl of the air; and brought them unto Adam to see what he would call them: and whatsoever Adam called every living creature, that was the name thereof. How formidable a task for Adam - himself just now created - to be called upon to name things, things not only unfamiliar to him, but things entirely new to the world! 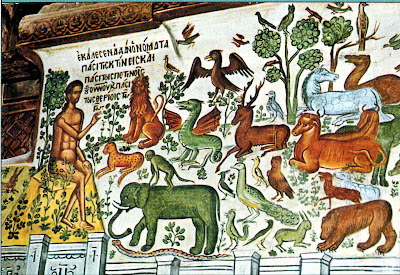 I imagine that Adam, struggled and stumbled, yet persevered, and came up with names for the animals, as commanded. No doubt, some of these names were fitting and clever, while others were out-and-out silly. But, what choice did Adam have? To have dominion over a thing means you have to call it by name. To the list of attributes that have been used to characterize to our species - "thinker", "tool maker", "culture bearer" - perhaps, "namer" should be added. Physicists, as scientists, have taken on the task of discovering things entirely new to the world and, with that assignment, they have taken on the responsibility of giving names to the things they discover. We can hardly fault them for struggling and stumbling. We can hardly fault them, now and then, for coming up with silly names. OK. I admit it. I do not have a clue about what I just read but I loved the graphics. Brother Ricky Northside Class of 1972. Highest Physics class that I took was called Physical Science for Native Georgians. Go Bro! !